A new title begins circulation next week from Image Comics. An original story by Donny Cates tells the story of Emmet Quinlan and otherworldly monsters in Texas. Cates has previously worked his writing talents on Paybacks and Buzzkill. He has collaborated with the projects illustrator Geoff Shaw before on publications such as Buzzkill, and it’s a partnership that has worked well. The story concerns Emmet Quinlan, an old widower rattled by dementia, isn’t just a problem for his children-his violent outbursts are more than the local cops can handle. When a tornado levels his home-as well as the surrounding West Texas town-a restored Quinlan rises from the wreckage. The enchanted sword at the eye of the storm gives him more than a sound mind and body, however. He’s now the only man who can face the otherworldly creatures the sword has drawn down to the Lone Star State. 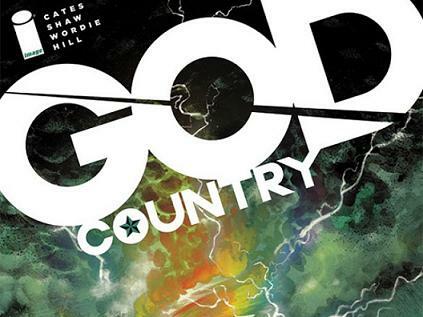 God Country issue #1 will be available in comic book stores from January 11th, and the second issue is scheduled for release on February 15th.